Safest way to spray wasp killer spray from a distance. Get rid of wasps hornets. A quality, heavy-duty 12ft 3-section extension pole. Constructed from a combination smooth composite fiberglass handle and aluminum tube for balance. Die cast metal 3/4" (2 cm) threaded end and heavy-duty chuck and collet locking device. A three section pole that extends from 4.25ft-11.75ft. If you all ready have an extension pole, please consider purchasing the Pro Spray-N-Dust System. 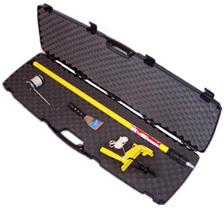 The Gotcha SprayerTM is an adaptor that enables you to attach and trigger virtually any type of aerosol can from the end of an extension pole. The Powder Duster is the perfect way to apply insecticide dust. It can be used by itself or simply secure the Powder Duster to the Gotcha Sprayer Pro, attach the Gotcha Sprayer Pro to an extension pole and you're ready to dust. The Angled Scraper is perfect for removing mud dauber nests, as well as, wasp and hornet nests. The 3-inch blade is made of heavy-duty steel integrated with a plastic handle. Use by hand or on the end of an extension pole. Finally a hard-sided case to protect your investment. This case has thick plastic wall construction on the outside with high density foam inserts on the inside. Case dimensions are approx. : 52"L x 4"W x 15"H.